Isca Greenfield-Sanders: Light Leaks features new paintings by New York-based artist Isca Greenfield-Sanders. 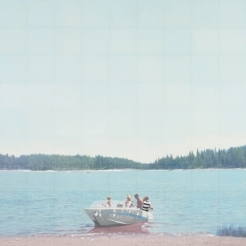 Greenfield-Sanders creates paintings based on found photographs from the 1960s, deliberately choosing flawed images as source material and preserving these flaws in the final works. In her Light Leaks series, the color banding, overexposure, and light leaks found in 35mm film photography serve as inspiration for the artist. In some works, she manufactures these blemishes herself. Greenfield-Sanders\' works reveal the contours between painting and photography, pushing them into an ambiguous realm between the two. MCA Denver is proud to present Isca Greenfield-Sanders’ first solo museum exhibition. Greenfield-Sanders was born in 1978 in New York City. She has been a visiting artist at the American Academy in Rome and her work has been shown at the Brooklyn Museum and the McNay Art Museum in San Antonio, Texas. She lives and works in New York. Isca Greenfield-Sanders: Light Leaks will be presented in the David & Laura Merage Foundation Gallery from October 15, 2010 through January 16, 2011. The opening celebration will be held Friday, October 15. A catalog with an essay by curator Nora Burnett Abrams will accompany the exhibition.